The MCB1800 board supports USB-A and USB-microAB connectors for both USB device, host and OTG operation. USB Device: In this mode, via either microAB connectors P2 or P4, a USB A to microB cable may used to connect to a PC. The board may be powered through this USB interface. USB Host: In this mode, the USB A connector may be used to connect to a USB device such as a USB memory stick. 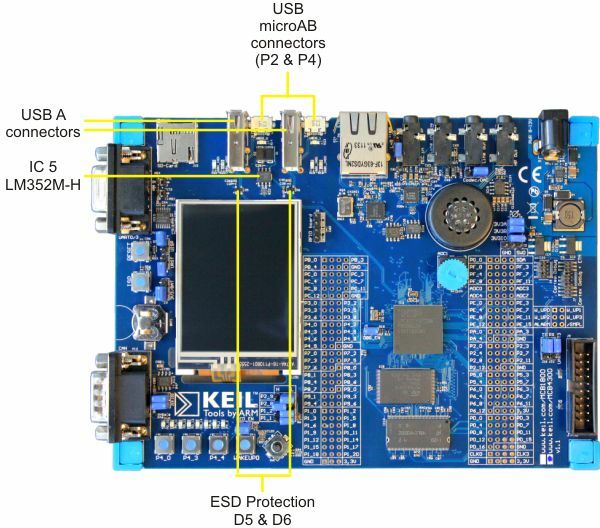 In USB Host mode, the board must be powered by an external 8-12V power adapter to guarantee a stable power supply of the connected USB device. USB OTG: In this mode, a Micro A USB cable is used to connect to another USB OTG device. In USB OTG mode, the board must be powered by an external 8-12V power adapter to guarantee a stable power supply not only for the connected USB OTG device, but also for the board itself. Although the USB specification for USB OTG only requires that 8 mA of current be supplied, this is well below the power required to operate the board. VBUS power controlled with an LM352M-H (IC5), which provides, over-current, short circuit and over-temperature fault protection. Additionally, the USB A and microAB connectors are protected by ESD protection circuits D5 and D6.